With our expertise in this domain, we are instrumental in offering our clients a wide assortment of quality-assured Voltage Stabilizer. The offered product are developed in confirmation to set industrial rules. Under this range Three Phase Servo Voltage Stabilizer, Single Phase Servo Voltage Stabilizer, Relay Type Voltage Stabilizer are few to name. In addition to this, the product is well acclaimed for its excellent features like high-durability and optimum performance. Moreover, our respected patrons can avail these products at market-leading price. 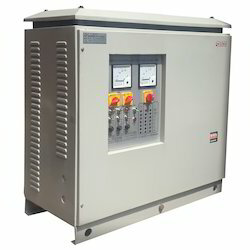 Our immaculate range of Three Phase Servo Voltage Stabilizer is highly demanded in the market by customers which are designed using excellent material, provides exceptional durability level with long lasting feature. Clients can avail in in various designs and patterns as per need. Our experts design these stabilizers in complete adherence to the international standards so that we successfully meet the expectations of our patrons. We are a preeminent manufacturer, supplier and exporter of a broad spectrum of superior quality Relay Type Voltage Stabilizer. The range made available by us comprises of best quality in international standard with perfect designing and high durability that are sourced from the most authentic vendors of the market. Offered at affordable prices, our product-line is applauded for its attractive sizes, perfect finishing and eminent durability. 3. Digital Display (7 Segment Display) to see input and output voltages. 4. Short circuit and overload protections. 5. HV/LV cutoff and time delay. 4. Built – in digital display (7 Segment Display) to monitor input & output voltages. 5. Input short circuit protection by means. 6. 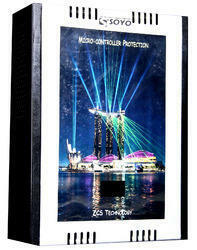 Output short circuit protection & overload protections provided. Frequent fluctuations or variations of power not only causes financial loss but man power loss too !... 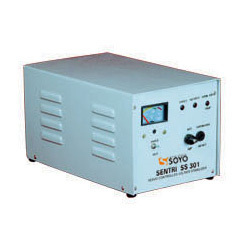 SERVO CONTROLLED VOLTAGE STABILIZERS beats these happenings and provides all extra care needed to your valuable equipments. 1) Fully Solid State Circuit for highest reliability. 2) Auto/Manual facility - in case of controlled card failure manual control of output is possible from front panel. 3) Unaffected by Load Power Factor. 4) Zero waveform distortion & phase shift introduced in stabilizer. 5) Input Short Circuit Protection by means of fuse. 6) Output Short Circuit Protection & Overload protection by circuit of MCB. We are a preeminent manufacturer, supplier and exporter of a broad spectrum of superior quality Single Phase Servo Voltage Stabilizer. The range made available by us comprises of best quality in international standard with perfect designing and high durability that are sourced from the most authentic vendors of the market. Offered at affordable prices, our product-line is applauded for its attractive sizes, perfect finishing and eminent durability. 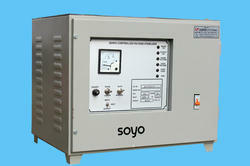 Looking for Voltage Stabilizer ?